University of California Press, 9780520275232, 350pp. "A valuable contribution to 20th century jazz history." "The book is full of . . . illuminating stories." "Mingus's candid intelligence shines through in these interviews as the discussion ranges through all aspects of jazz, from composition to performance to history and more, and on to matters of American culture, politics, and race. . . . 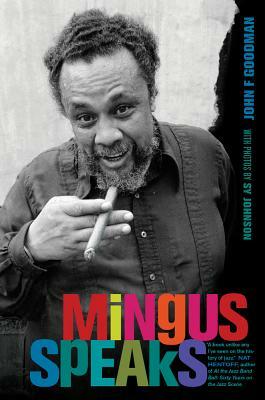 Fans of Mingus will definitely want to get their hands on this book." "What's clear from Goodman's fluid interactions with Mingus is that the bassist trusted him. Consequently, Mingus' thoughts have the ring of honesty about them, even if his versions of certain events were often at odds with the way others perceived them. . . . Goodman extracts plenty of material that will delight Mingus' fans and ignite debate." "Known for mind-gaming journalists, Mingus is open, voluble and very funny here, clearly due to his trust for the interlocutor. . . . Like a tasteful musician, Goodman lays out until the improvisational repartee calls for him." "Mingus Speaks provides a wealth of new perspectives on the musician’s life and career. . . . Much of what Mingus shares shows him in a new light: his personality, his passions and sense of humor, and his thoughts on music. The conversations are wide-ranging, shedding fresh light on important milestones in Mingus’s life such as the publication of his memoir, Beneath the Underdog, the famous Tijuana episodes, his relationships, and the jazz business." "Goodman is a superb guide to Mingus"